As the https://en.wikipedia.org/wiki/Pantone said "The Pantone Color Matching System is largely a standardized color reproduction system. By standardizing the colors, different manufacturers in different locations can all refer to the Pantone system to make sure colors match without direct contact with one another." 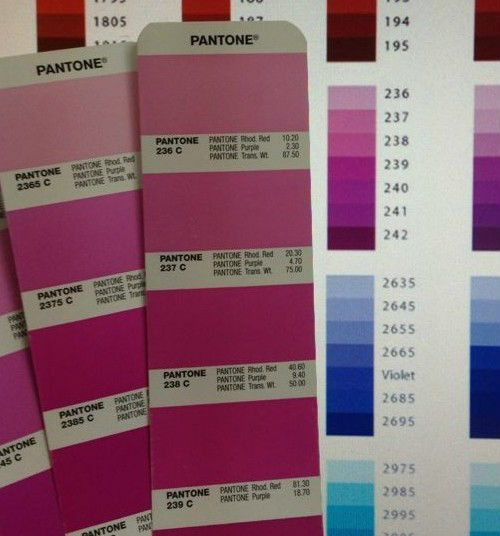 We also use the pantone color data to get the color of our business signage products. If clients need the signage in color, we need our clients give us the pantone color data. BTW, we use the "Pantone Formula Guide Solid Coated Chart". The follow image is for reference only, click it you can get a High-definition chart, some color names have been abbreviated in order to save space: “Pro” referes to “process”, “wm” to “warm”, “cl” to “cool”, and “rhod” to “rhodamine”. The follow image is used to show you the difference between the "Pantone Formula Guide Solid Coated Chart" we used and the chart image you can see in this page.